When I arrived in the garden next to the tea house, there was already quite a crowd: Syl, Steve and Hotaru were seated and Pia was walking in, so there were five of us. The photos included were kindly provided by Sylectra. Pia Iger: big crowd today. Pema Pera: It’s hard to land gracefully with laaaag…..
Sylectra Darwin: But I saw you do a cool flip de flip! Briefly, we were all sitting on a row on the stone benches, but soon Pia and Hotaru would move to the wooden plank next to the tea house. Sylectra Darwin: Anybody mind if i take snapshots? Pema Pera: of course, fine Syl! Sylectra Darwin: Oh, how exciting. When do we see it? Pia Iger: where is the new room? Pia Iger: I think I went there once by accident. Pia Iger: I suggest we go inside since there are so many people here. Sylectra Darwin: I think I am lost. I was curious to see how far the new meeting place was from the old one. 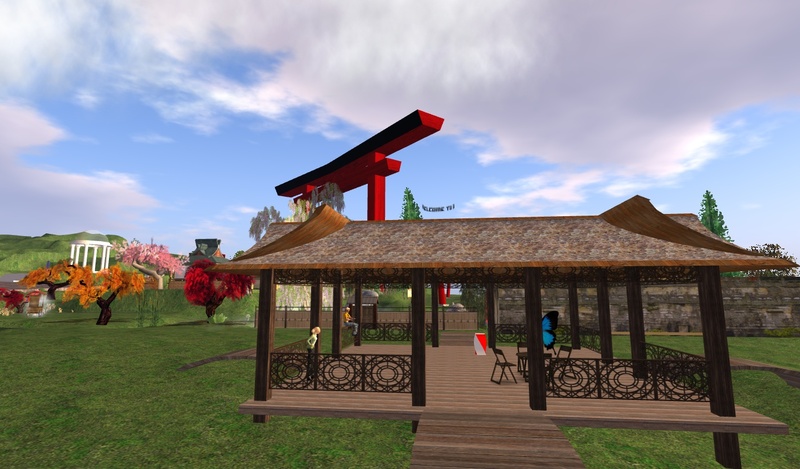 And with so many avatars near the tea house, we might as well start to explore the new place, as long as at least some of us would stay behind to greet new visitors, if necessary. Pia Iger: how is going? Pia Iger: are we moving over there? Pia Iger: wow, hope they won’t get lost. Pema Pera: How are you doing, Rajah? Rajah and Dakini were joining us, just when I had returned to the tea house. Terri would follow soon. Dakini Rhode: Hello Pia, Pema, Rajah! Pema Pera: and hear their comments! Syl and Steve returned from their exploration of the new place. Pema Pera: Hotaru, come join us! It was nice to see Thor again, after a long time. After him, Doug joined us, and then there were eleven of us. Pema Pera: well, Dakini, you were just in time, starting to build a new place! Rajah Yalin snaps photos of Terri. Sylectra Darwin: that would be me, do you mind if I take a few snapshots? doug Sosa: hi, trouble at the border. Sylectra Darwin: I promise not to be annoying or incriminate you. Sylectra Darwin: I would stop if asked. With this large a group, it seemed like a good occasion for a poll, concerning a possible addition to formats for our meetings. Pema Pera: now that we have crowd, let me throw out a question for you: I have been thinking about introducing a variation to the theme of our normal gatherings: how about occasionally starting with a dialogue with two people, for the first 30 minutes, followed by a free for all for everybody to join in the next 30 minutes? stevenaia Michinaga: which two Pema? doug Sosa: hi. Pema, an hour is too long for me now. Thor Friedlander: do all of you know each other? doug Sosa: and the spontaneity of not entering. Thor Friedlander: nice, is this a daily thing? I continued to sketch the option of introducing a few sessions that would be more focused, with two discussants for starters. doug Sosa: I keep being at dinner time, like tonight i get to cook, so i will need to leave in ten minutes. doug Sosa: guardian email list? Pia Iger: Pema, I think 3 persons is better than 2 person. Pia brought up an interesting idea, to use three discussants instead of two. doug Sosa: how come happy and yogi and adams are lit and the rest of us are not? Sylectra Darwin: those are face lights. Pia Iger: Me and Adams are new guardians. doug Sosa: like adams, bright. Pia Iger: Why Rajah think it is tough job? Sylectra Darwin: Oh you mean the white dots over the heads? Sylectra Darwin: Voice chat enabled. Pia Iger: you scared me. doug Sosa: need to go. bye. Doug left, Terri returned, and Dakini left as well. Pia Iger: see you. Dakini. Pia started her experiment, to see whether a large crowd could meaningfully talk about a single topic — an interesting attempt, which turned out to be quite successful. Pia Iger: How about we talk about compassion? Rajah Yalin: the, uh… second one that is..
Pia Iger: I never thought that way, Setve. stevenaia Michinaga: it can;t be that difficult to be compassionate, can it? stevenaia Michinaga: yes, but what do you receive from being pissed off and grumpy? stevenaia Michinaga: help us with resignation Thor? Adams encouraged Thor, in the same way that she had been encouraged by us to keep her blog online. Steve and Pia followed Adams’ example. This was one wonderful example of the mutual support that the PaB players give each other, in a low-key and very open way. Pia Iger: yes. Thor, you did well. Pia successfully turned the conversation topic back to compassion. Pia Iger: sounds like it is easy for us to feel compassionate, but hard to act on it? stevenaia Michinaga: Do you mean feeling the gift of compassion from someone else Pia? Pia Iger: when I say “feel compassionate”, I mean my heart feels love or kindness to someone. Pia Iger: but at the same time, I may feel hard to have the love/kind action. stevenaia Michinaga: what stops you? Rajah Yalin: how do you get in the ‘compassionate’ state of mind? stevenaia Michinaga: wonders where humanities road blocks to compassion are, Pia? Adams left, and the conversation continued. stevenaia Michinaga: is it a state of mind or an act toward another? Pia Iger: we felt sympathy to unfortunate people, but we rarely do anything about it. Pia Iger: I think there is distance between state of mind and the act. Sylectra Darwin: I think that has to come first. Pema Pera: but who are you and who are we all? Steve asked a very pertinent question. stevenaia Michinaga: isn;t Being no role, or just another role? Pia Iger: I don’t get it. Pema Pera: amazing that we can even talk about it! Sylectra Darwin: what does being taste like? I liked Thor’s way of capturing the essence, but didn’t get around to respond to it at that moment. Pema Pera: and see: have or is? stevenaia Michinaga: it being devoid of good and bad? or assumed goodness? Time for Rajah to leave, after which Holden joined us. Pia Iger: Trust Being, I want to chew on that. Holden Henig: can i sit? stevenaia Michinaga: are you suggesting they will find goodness? Thor brought up the tension between being and doing. Pema Pera: as soon as we talk about a person doing this or that, we have lost of Being already . . . . I meant to say that Being is not “your” Being, it is beyond individuals, beyond any notion of beings. Meanwhile Luzifer had joined us. Thor Friedlander: aren’t we all Being equally at the same time regardless of any individuals awareness of Being? Holden Henig: does being require awareness of being? Holden Henig: is that the question? Pema Pera: Being is not part of the movie or story or dream that we have bought into . . . .
Thor Friedlander: how does this understanding help someone…? Thor asked the crucial question. Clearly, this question will continue to hold our attention over the months and years to come. I look forward to all of us coming back to this question, from many directions. In this context, I just gave a rather broad characterization, more a gesture. Holden Henig: You see that there are no problems to solve, and that is the goodness of it? That was a quote from Nisargadatta. Steve had just given a interestingly different description, but it would take just a bit before I could come back to that one. Holden Henig: I am the universe realizing that it exists? Pema Pera: come back any time! We all had to smile about Thor’s gentle conclusion. Pema Pera: how odd . . . . . .
Pema Pera: doing pretty well . . . .
Pema Pera: Do you mind if we mention your name in the blog? Indeed, Luzifer looked very comfortable, stretched out in the grass between us. Pema Pera: yes, you look the most relaxed of us all here ! Pema Pera: or up late? Pia Iger: see you, pema. Pia Iger: bye, all. until next time. Pema Pera: and bye Steve and Syl!